Emergency teams have been pouring into western China's Qinghai province, a day after a deadly earthquake devastated the mountainous region. Thousands of homeless people and casualties are waiting for help. China now says 760 people died and 11,477 were injured when the tremor hit Yushu county early on Wednesday, while 243 remain missing. Chinese Premier Wen Jiabao had travelled to Yushu to see the relief operation, state media said. He has postponed a visit to South East Asia because of the earthquake and China's President, Hu Jintao, is cutting short a visit to South America and returning home. Mr Hu called the earthquake a "huge calamity" and confirmed he was returning from a summit in Brazil. Speaking at a news conference in the capital, Brasilia, on Thursday, he said: "That is why I decided to bring forward my return to China." The rescue teams are facing a number of logistical challenges. "Freezing weather, high altitude and thin air have all made rescue efforts difficult," Hou Shike, deputy head of China International Search and Rescue, told official news agency Xinhua. In one direction on the road to Yushu county, long convoys of heavy-lifting equipment, military vehicles, relief supplies, soldiers and police are heading to the worst-affected area. In the other, one or two families of refugees are heading away from the quake zone. What looks like all they could salvage from their homes is packed on the back of small tractors. It's bitterly cold here - they try to shelter from the wind, huddling among their small possessions. Meanwhile, in the area behind them the rescue operation continues. It's very hard to reach this rural area, 4,000m above sea level, and rescue teams have travelled considerable distances from neighbouring provinces. There are shortages of tents, as well as medical workers, equipment and supplies. The relief effort has been further hampered by a series of aftershocks. Yushu sits at about 13,000ft (4,000m), making work difficult for teams not used to the high altitude. Further logistical problems were posed by aftershocks. The quake also knocked out phone and power lines, and triggered landslides. Survivors shivered through Wednesday night in the open as temperatures fell below freezing. In the township of Jiegu, 85% of buildings have been destroyed, officials say. 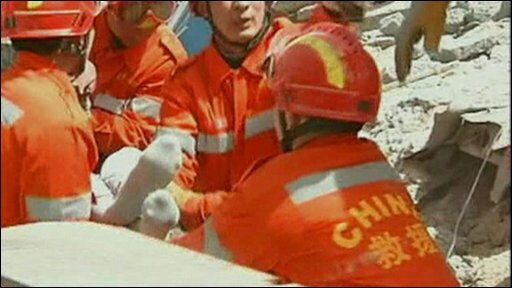 Several schools collapsed and at least 66 pupils and 10 teachers were among the dead, Xinhua reported. State broadcaster CCTV showed anxious parents waiting overnight outside Yushu Vocational School, where 22 students, mostly girls, were reported dead. The flattened schools echoed scenes from the quake that hit neighboring Sichuan province two years ago, leaving nearly 90,000 people dead. Revelations of shoddy construction and lax building regulation infuriated grieving parents in the aftermath of that disaster. About 900 people have been pulled out alive since the 6.9-magnitude quake struck on Wednesday morning, at the shallow depth of 10km (six miles). Rescuers saved one girl who was trapped for more than 12 hours under debris. As she was placed on a stretcher, she could be heard saying: "I'm sorry for the trouble. Thank you, I will never forget this." Wu Yong, a local army commander, said the death toll could rise as many houses had collapsed. President Hu has called for an all-out emergency effort and some 5,000 rescuers, including 700 soldiers, have been sent to the area, which is on the Tibetan plateau. The civil affairs ministry said it would also send 5,000 tents, as local officials in Yushu reported a lack of shelter, medicines and medical equipment. A hotel manager in Jiegu, Ren Yu, said it was like being in a war zone. "Some of the people have broken legs or arms but all they can get now is an injection," he said. "They were crying in pain." Forecasters predicted wind and sleet in the coming days, putting homeless victims of the tremor at risk of exposure. The region is prone to earthquakes but, according to the US Geological Survey, this was the strongest tremor within 100km of the area since 1976.